This is a small station around 2.5 miles north of the terminus at Wemyss Bay. In its time, this was a very attractive twin platform station with buildings in a style very similar to what we still see at Wemyss Bay. Sadly this has all gone and been replaced as a single platform halt, with a small shelter to give a little protection to the rail passengers. 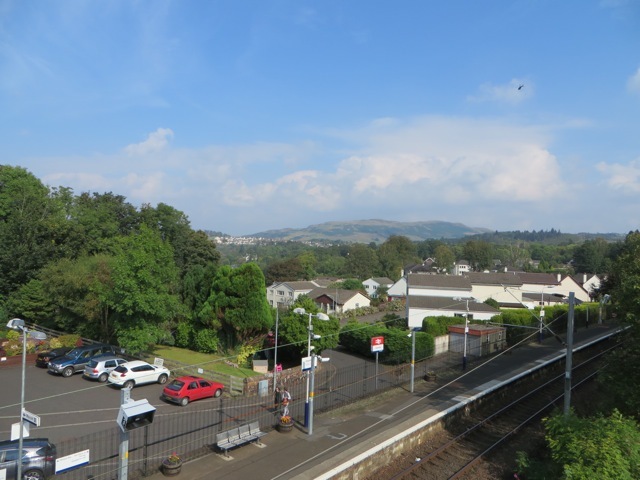 Ironically, with the endless growth of new housing around Inverkip, the small station may soon be enjoying passenger numbers that it has not seen in years! As with many stations, parking is very restricted. Approaching the station from Inverkip village up Station Road, the only spaces will be found generally on this fairly narrow road itself, far from ideal. On the south side of the station, approached by a footbridge complete with lift, is a very under-used free ‘Park and Ride’. However to reach this excellent car park you have to approach the area by using the A78 slip road junction about one mile south of Inverkip, and drive uphill around a half mile before turning left down Lairds Dyke. After about a 1/3rd of a mile downhill, turn left along Lochans Drive a short distance to the parking area. There are a number of choices, some could easily form a circuit with a return to Inverkip, or others with Wemyss Bay Station as a final destination. The A78 is a fairly busy main road along the Clyde coast and it is, of course, more pleasant not to use the pavement next to the roadway more than anyone needs to! 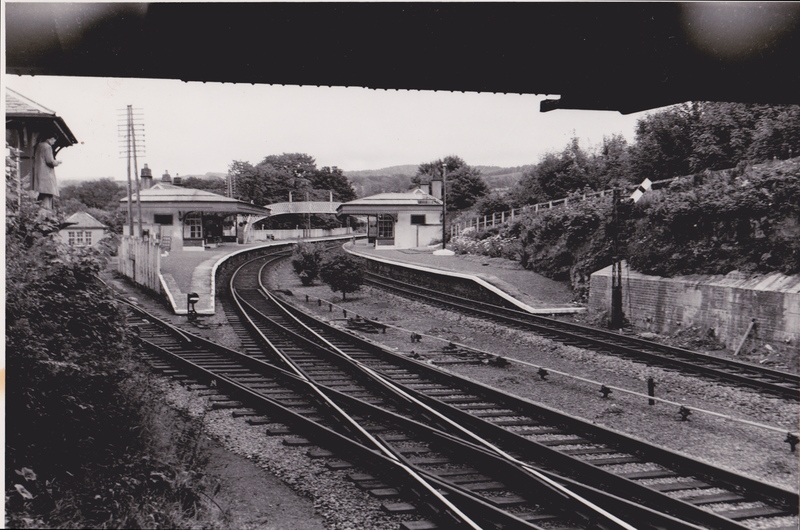 Inverkip Station to Wemyss Bay Station. Leave the station and head down Station Road, turn right along the village main street until just past the Inverkip Hotel, there is a footbridge across the A78 in the direction of the Marina. Once across the bridge turn sharp left until you meet the A78, then right along a good footpath set well back from the roadway. After a short distance the route curves sharply round to head almost due south towards Wemyss Bay, the large marina is to your right. 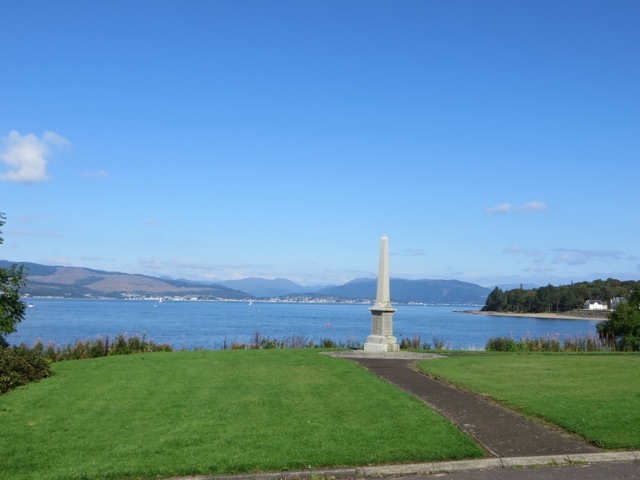 By the War Memorial there are very fine views across the Firth of Clyde. Continue south for 3/4 of a mile, and once you pass the slip roads for what was once the very large Inverkip Power Station, of which no trace now remains apart from the oil jetty, you can proceed another quarter of a mile to the junction of Ardgowan Road. Here you have the choice of continuing alongside the A78 on the pavement all the way to Wemyss Bay Station, or to turn right down Ardgowan Road, straight on through a ‘mini roundabout’ and all the way downhill till you meet the Clyde shore. Then along this attractive and quiet route till it rejoins the main A78 after about half a mile. Turn right and in just over a quarter of a mile you will reach Wemyss Bay Station. Distance 2.8 miles and will take around one hour. The shore route down Ardgowan Road will take a little longer, but is much more pleasant than walking next to the busy main coastal road! An alternative to route (1) would be a circuit back to Inverkip Station. Start with all the directions indicated in route (1) above, but once you reach the area of the slip road junction mentioned above turn left under the road bridge, then straight ahead up the hill using the footpath on the right hand side of the road. Take care when approaching this road as there is little in the way of pavement under the road bridge! In three quarters of a mile turn left downhill. There is a modern housing estate to the right. This is called Lairds Dyke Road. Follow this downhill about half a mile, at the bottom turn left along Lochans Drive, and after around 300 yards the station will appear to your right, approached by a very easily used footbridge. Level access from this direction, and steps or lift at the platform side. 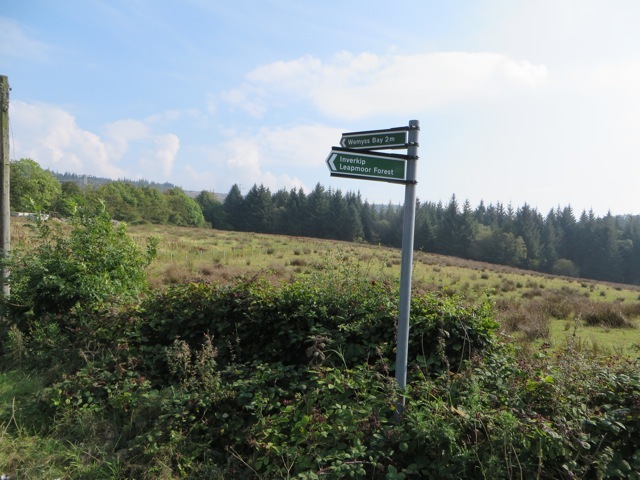 There are two or three direction signs for walkers indicating Inverkip. Distance 2.5 miles and should take less than an hour. Leave the station by the overhead bridge accessed by stairs or lift. After an easy level walk turn left onto Lochans Drive and Lairds Drive. After around 300 yards through this modern estate turn right uphill on Lairds Dyke Road. This runs for around half a mile bearing slightly to the right. After this uphill walk, during which you will pass a ‘Footpath’ guidepost, turn right on a gently downhill road. After around 400 yards, turn left on a track towards a small cottage. This track is marked by a ‘Footpath’ guidepost marked Wemyss Bay 2 miles. There are two wind turbines in sight to the left, the path will pass close to these. This rural, reasonably broad, and very old roadway runs fairly straight and almost due south for 1 and 1/4 miles till it reaches Kelly Mains farm. Apart from the almost invisible ruin of a small cottage around half way along, this is a very remote roadway with no farms or virtually any signs of shelter. This extremely old road is interesting as much of its length has been cobbled which means that at some time there must have been a volume of cart and carriage traffic. Perhaps it might even predate the line of the existing coastal main road? Though the surface can be varied this route is relatively level and a very pleasant walk. At Kelly Mains farm there is a choice of routes. Either to turn right, then downhill a half mile to the main A78, a quiet single track road though it does take you slightly to the north. Then left alongside the main road for a half mile to the Wemyss Bay Station. Or … left past the farm for 200 yards where you then enter the top of the very large Parkdean Wemyss Bay static caravan park. Travel downhill through this area till you reach the main coastal road, the station can then be seen to the right. This static caravan park was the original site of the Kelly House mansion and estate, the road follows the route of the original driveway, therefore the zigzags and tight corners! Distance 2.5 or 3 miles depending on which route might be chosen, and again depending on the route, take around an hour and a quarter to an hour and a half. Surface conditions can vary quite a bit, from pavement to mud, and on time of year. Wemyss Bay to Inverkip Station. After (3) a return could be made to Inverkip along the A78. It should be noted that the A78 is a main trunk road and traffic can be heavy. However, though most of the pavement is directly beside the roadway, there are reasonable stretches where the footpath is set back someway, and this does make walking a little more pleasant! Eating places at Inverkip and Wemyss Bay. 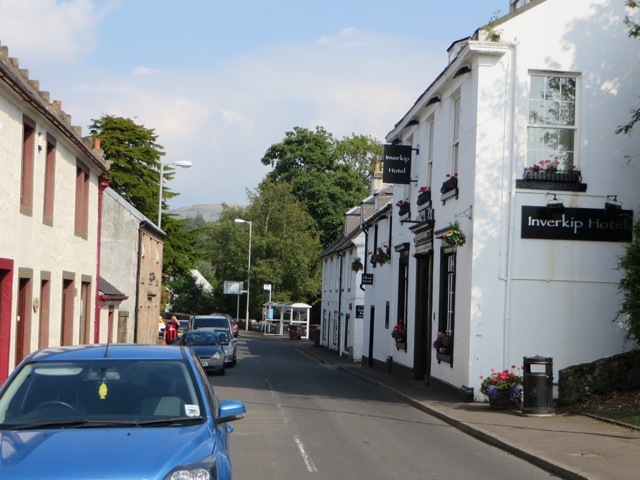 In Inverkip village there is the Inverkip Hotel on the main street. Pub-type meals at the front of the hotel, and a fair-sized restaurant at the back with a fairly extensive menu. In the Kip Marina there are two options. ‘Cafe Riva’, as it sounds, a cafe under the Chandlery area, small but well worth a visit, and the very much larger ‘Chartroom’ towards the back of the marina offering an extensive menu and the opportunity to look out across the over 600 berths, holding the many yachts and power boats. In Wemyss Bay there is the ‘Seaview Cafe’ opposite the station, rather more than a cafe, and offering an excellent menu. In the station itself there is the ‘Station Bar and Cafe’, very much a station cafe with a simple food choice, but excellent as most food on offer is made on site! Inverkip Hotel, Main Street can be busy, but the hotel has parking around the back. Cafe Riva and the Chartroom have no problem in finding parking spaces. Seaview Cafe and the Station Bar and Cafe – this area can usually be difficult, though the Seaview does have a few spaces at the side of the building.